The narrator of this story is the adult Trevor Riddell but the story takes place in 1990, when Trevor was fourteen. His parents have gone bankrupt and are having a trial separation. While his Mom has gone home to England, Trevor accompanies his father to the huge but dilapidated family estate, Riddell House. Built with the massive fortune of the timber trade and made from giant whole trees, it was situated on a bluff overlooking Puget Sound. Trever’s father, Jones, is there to join forces with his sister Serena. The plan is to sell off the house and property for development and then send Grandpa Samuel, experiencing dementia, to a nursing home. Trevor has an agenda to keep his parents together and believes the money from the sale will help. He becomes acquainted with Ben the ghost of the mansion, a Riddell who was a passionate environmentalist and determined to reveal to Trevor the reasons that it is imperative to respect the wishes of the family patriarch, Elijah. Elijah had mandated that the estate be returned to the forestland as payback for the millions of trees harvested by the Riddell family. Trevor learns more about the history of the family and the curse that plagues it with the help of old journals and even experiencing Ben’s life through dreams. Trevor realizes that he wants to do the right thing and help Ben achieve the goal to keep the land pristine and undeveloped, even if doing so violates his father’s wishes and threatens to destroy his chance of connecting with his father and his parents reuniting. This beautifully written story pays tribute to the beauty of the Pacific Northwest with an atmospheric moodiness that contains a hint of danger. At once a family saga and ghost story it speaks of the weight of past generations and the present family’s struggle to connect with each other even after death. Why are we attracted to a novel? I mean, what makes us pick it up in the first place? What makes us put it down? What makes us pick it up again and want to read it? I find myself attracted to certain themes, or times, or countries, over and over again. Sometimes I feel as if I am just looking for stories that are variations on the same theme. Sometimes I think I am searching for books that make me feel the kinds of emotions that I felt in childhood and adolescence. Sometimes I wonder if the books that I choose to read now, as an adult, are an unending search for what I read as a child. And sometimes I wonder if I am just constantly looking for that one perfect story – that one that will change my life, or that will be SO GOOD that I never want to read another story. So far I haven’t found anything that would stop me from reading another word again, thank goodness, but occasionally I read a book that kind of ruins me from reading another book for a few days, anyway. Are the stories that we look for as adults a repeat of the stories we read as children? Do we spend our adult lives yearning for the stories of our childhood, as if we are searching for something that was lost? I really really like English novels – and Welsh, and Scottish, and Irish novels. Not all of them, obviously, but the kind of novel that evokes the feelings from childhood I remember. As though there is more going on than what we see in front of us, and where it is not always apparent which time we are in. More than American stories, British stories have this feeling of the past and the present existing simultaneously. I always thought this was because the weight of the past is so much heavier – having more baggage, if you want to call it that – in Britain than here in the New World. Here in the Americas, there is less history to contend with and so our stories tend to be less about the past and more about the future. When I was a kid in the 1970s, I loved anything to do with Celtic history and King Arthur and I loved two stories in particular: Susan Cooper’s The Dark is Rising series, and Nancy Bond’s A String in the Harp. Into the Grey is a story by the Irish author Celine Kiernan, and there is nothing Arthurian or mythological about it, being set in 1974 Ireland; yet the feeling that I got from this book reminded me of those beloved childhood books. The story is about two fifteen year old twin brothers, Pat and Dom Finnerty. Their Nan, who hasn’t been herself since her stroke, accidentally burns down the family home, and the boys, their parents, their young sister, Dee, and Nan must move to the seaside cottage that they have summered in. Only now it is winter, and the cottage is desolate, cold and windy. The past is never over, remember, particularly in Ireland in the 1970s, and it soon becomes obvious to Pat that Dom is haunted by a ghost. Dom will die unless Pat can figure out how to save him, but Pat is afraid to say anything to his parents, who are overwhelmed with their own problems. The ghost turns out to be a young boy (Francis) who died of diphtheria prior to World War I, and whose twin (Laurence) died in the mud at Passchendaele. They both exist in a limbo between the living and the dead. Nan holds the key to figuring this out — if only she can remember her past, because she is one of the links. The past and the present seem to co-exist simultaneously, and this eerie, dreamy kind of feeling is what reminded me of some of those childhood novels. Robert Dunbar’s review of Into the Grey, which is on Celine Kiernan’s blog (http://celinekiernan.wordpress.com/robert-dunbars-intro-to-into-the-grey/), talks about the theme of loss far better than I ever could. He talks about the loss of life, of brothers, of friends and comrades, of home, of memory. He mentions a heartbreaking passage about the horrific loss of life in the mud of World War I: “So. That’s how it happens. All the time. All over the world. People just fall away. There’s no warning, and you can’t do anything about it. No matter how old you get. You just lose people and lose people and lose them again, and you never get them back.” I loved this passage (I had highlighted it in my copy of Into the Grey, too) because it sums up the complete randomness of loss of life, no matter how much meaning we may attach to it. It’s a pretty dark sentiment for a YA novel, really. However, I think there is one more important theme in this novel: the bond of love between brothers. Pat will do anything to get Dom back from being haunted to death. And Laurence has never given up looking for his brother Francis, with the result that they have been stuck in the Grey area between life and death for over 50 years. Patrick must venture Into the Grey to save Dom, risking his own life to save the life of his brother. Into the Grey is a quiet novel that gradually grew on me, and I heartily recommend it to both YA and adult readers. Aref is 8 or 9 years old and lives in Muscat, the capital city of Oman, a place he loves. His parents are university professors preparing to move the family to Ann Arbor, Michigan for three years of graduate study, and Aref is NOT happy at the prospect. The book covers the week before leaving (starting with the father’s advance departure) and how Aref gradually adjusts to the move as his mother hurries to finish all the preparations. One senses that he may have been a bit of a pill about it, and that his mother may have conferred with her wise, elderly father, known as Sidi, because Sidi effectively takes Aref out of her hair for extended periods. Aref and Sidi camp overnight in the desert, they visit an old fisherman friend on the coast, they enjoy a breakfast together at Sidi’s familiar house, and Sidi gently helps Aref grow up just enough to be able to pack his bag and cooperate with the family’s larger plans. Nye’s poetic voice shines through in the charming dialogue, the affectionate descriptions, the longing for that which cannot be. 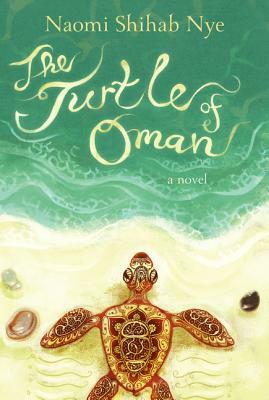 The Turtle of Oman is not a book of adventure, suspense or romance. It’s a book about the foundations of self: place, family, nature, experience. It’s a small jewel, perfect for sharing aloud as a family prepares for change.